Because a group of personnel beams simultaneously, all four of the personnel discarded by this incident are considered to leave play simultaneously (the cards are still placed in the discard pile one at a time so the opponent can see them). See exchanging cards. 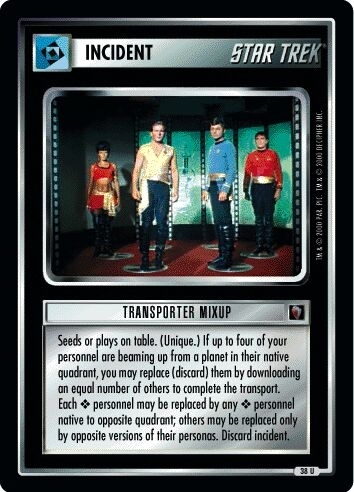 There are 22 entries for Transporter Mixup (ST1E 11 U 38) at the Tradeplace (45 haves and 3 wants). Click here to see all trade list entries for this Uncommon card!